To kickstart the holiday gift-giving season, San Francisco's WaterField Designs is giving away a Microsoft Surface Pro 3, a TypeCover and a WaterField Outback Solo case—value: $1,257. The sweepstakes runs now through November, 10, 2014 and entering is quick and easy. We’ll be giving one lucky winner the tablet along with our Outback Solo—an all-in-one custom-fitted accessory case that can be used as a minimalist bag or a case within another bag. To kickstart the holiday gift-giving season, WaterField Designs—an innovative San Francisco designer and manufacturer of custom laptop sleeves, designer bags and cases for digital gear—is giving away a Microsoft Surface Pro 3 (128GB), a Type Cover and WaterField’s own American-Made, waxed canvas and leather Outback Solo Case, all to one lucky winner. The sweepstakes runs now through November 10, 2014 with a grand prize value of $1,297. Entering is quick and easy, and participants may increase their chances by entering in a number of ways. Dubbed “the tablet that can replace your laptop,” the SP3 boasts a responsive, bright touchscreen, stereo speakers with Dolby® audio, and two 1800 p cameras. Rated 4.5 out of 5 stars by Techradar and called “Microsoft’s biggest and best tablet yet” by Engadget. 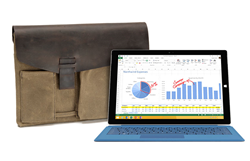 This modern waxed-canvas and leather case has a vintage feel and protects the SP3 plus accessories for an all-in-one office solution. The winner will also receive a leather and nylon removable strap, so the Solo can be used either as a minimalist shoulder bag or as a case within another bag. WaterField Designs offers additional custom-fitted Surface Pro 3 Cases—the Ultimate SleeveCase, the Suede Jacket, the CitySlicker, the Outback Solo, and the Travel Express, each entirely handcrafted in San Francisco. Sweepstakes runs now through 11/10/2014. Additional Surface Pro 3 Cases—available now from the WaterField Designs online store. WaterField Designs, and Outback Solo are trademarks of WaterField Designs. Other company/product names may be trademarks of their respective owners. Copyright © 2014. All Rights Reserved.